Hello little sad, neglected blog! 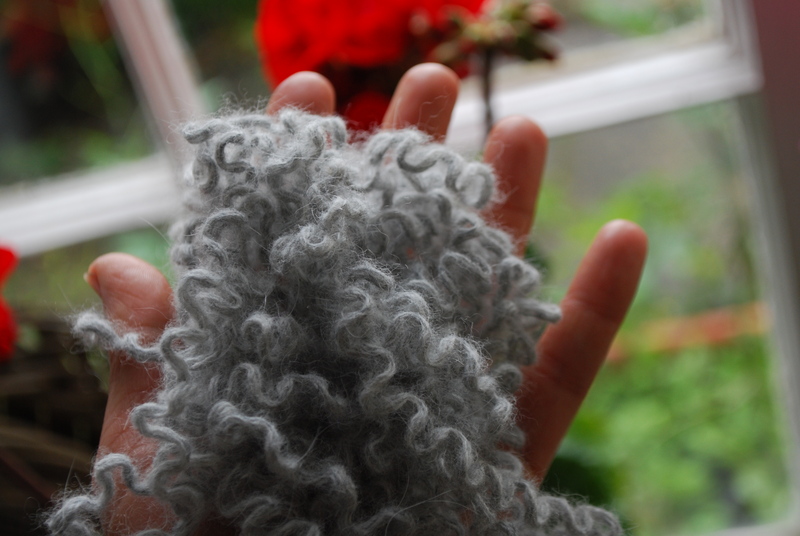 Life has been a bit busy of late but I have been crocheting away on a number of secret projects, all of which will be revealed in due course. 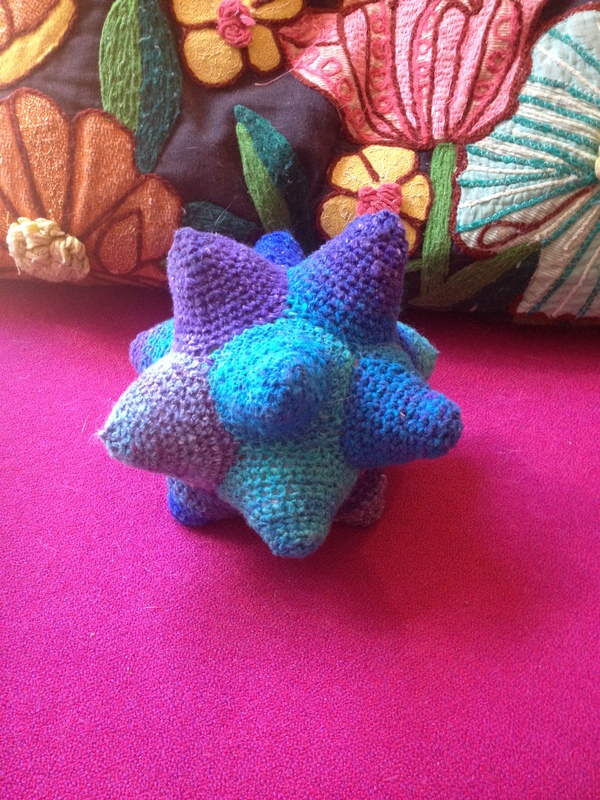 I have started my post today with the handsome Mr Tom who lives in Tel Aviv and is the proud owner of the first celestine crochet star I ever made. 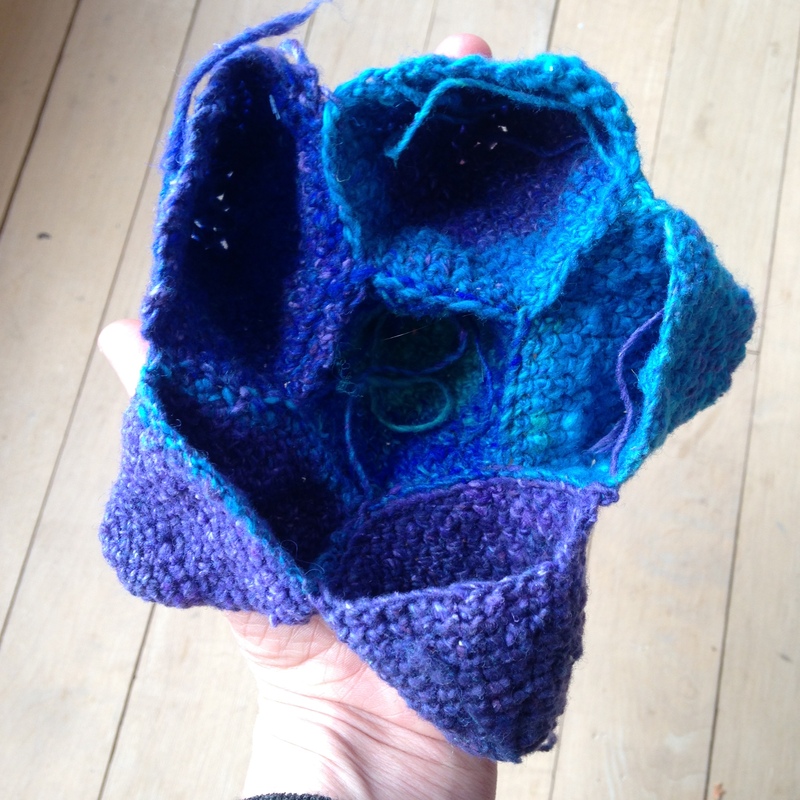 I have made four of these now which are owned by various small children: Tom, Arlo, Iris and Greta. 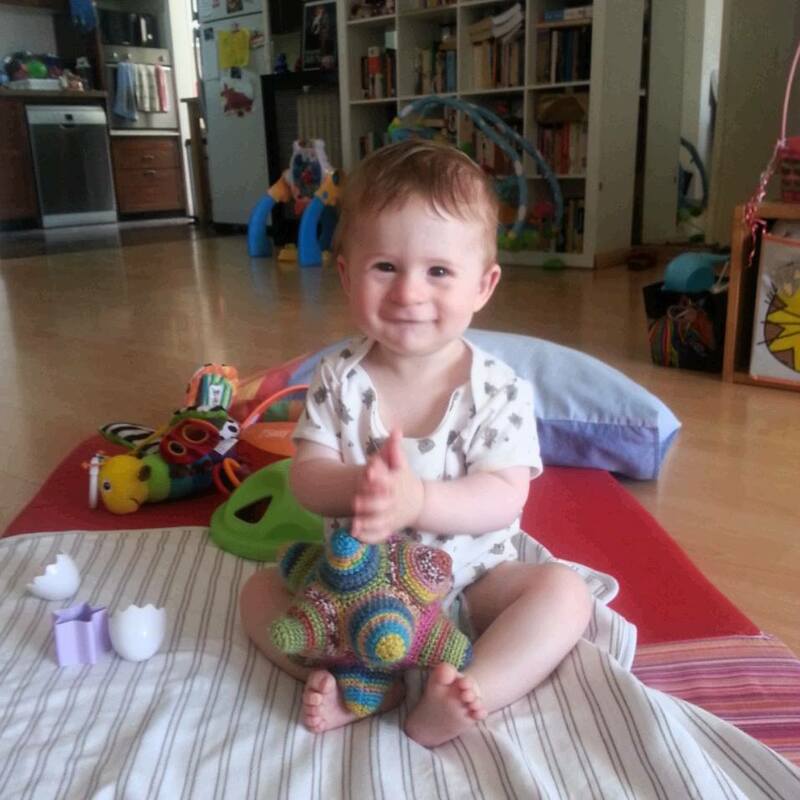 I put a rattle inside made from the plastic capsule inside a Kinder egg and some lentils. 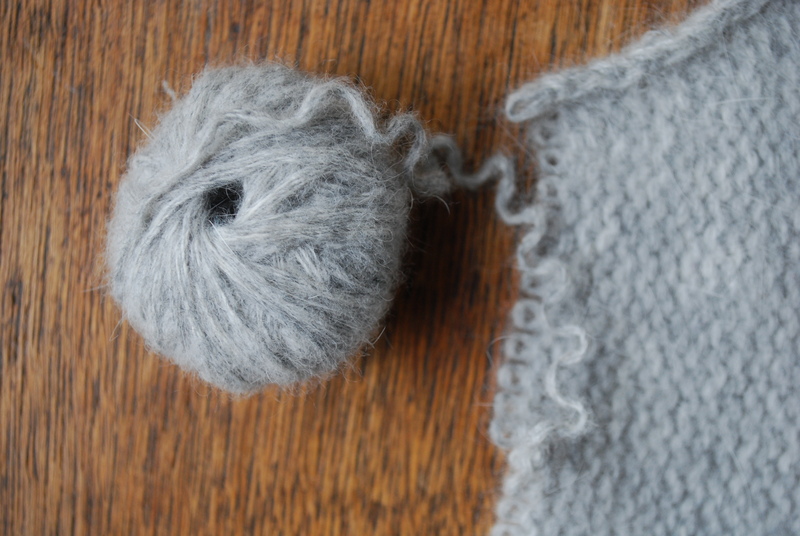 The pattern is available as a free pdf download from Berroco. I made my most recent one for my gorgeous new niece Greta. We have just spent the weekend together so I have had a lot of blissful newborn cuddles. 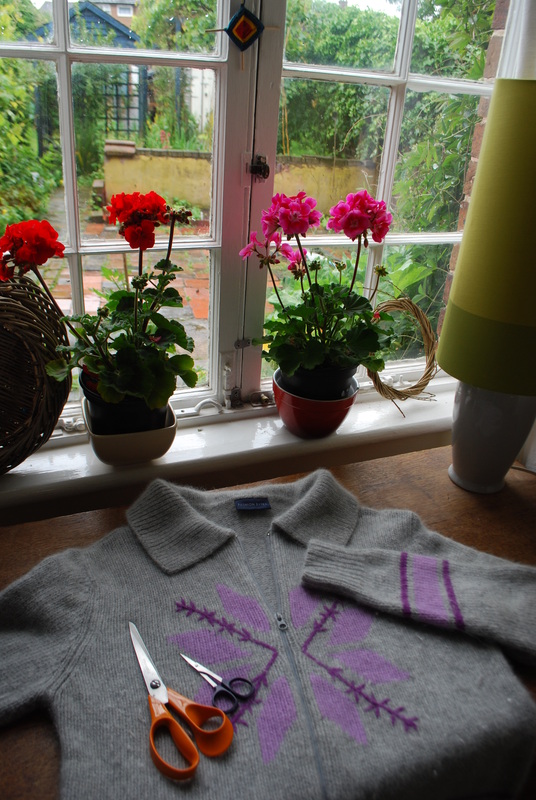 I have made the previous ones from self patterning merino which made for a lovely result. 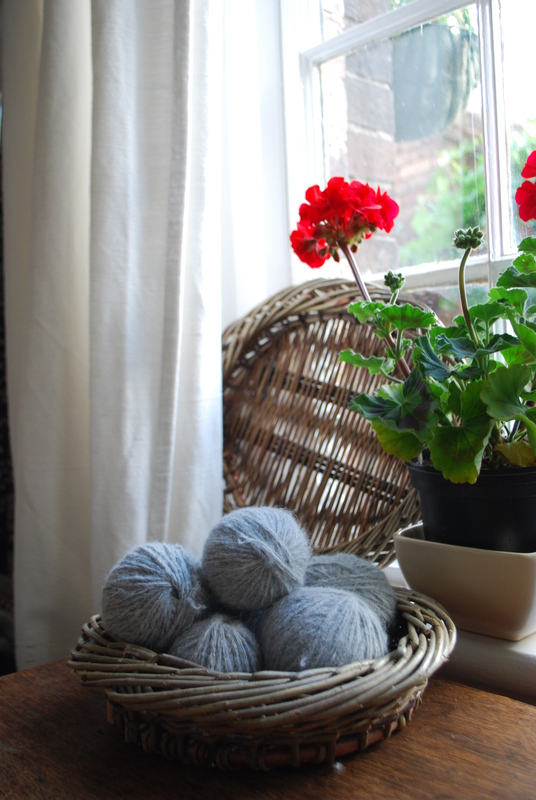 For this one I thought that I had found the perfect project for the Noro yarn that I bought some months ago and has proved a tricky customer with other projects. Firstly, it does this….twisty, twisty. It is also really slubby and varies widely in thickness so the results are fairly knobbly and uneven. The colours are lovely though, so I persisted with the knobblyness. The star is made from 12 points that are joined as you go, it looks complicated but it really isn’t. The finished article is a rather strangely shaped sea creature but the colours work well and I don’t think that Greta minds a few uneven bits. 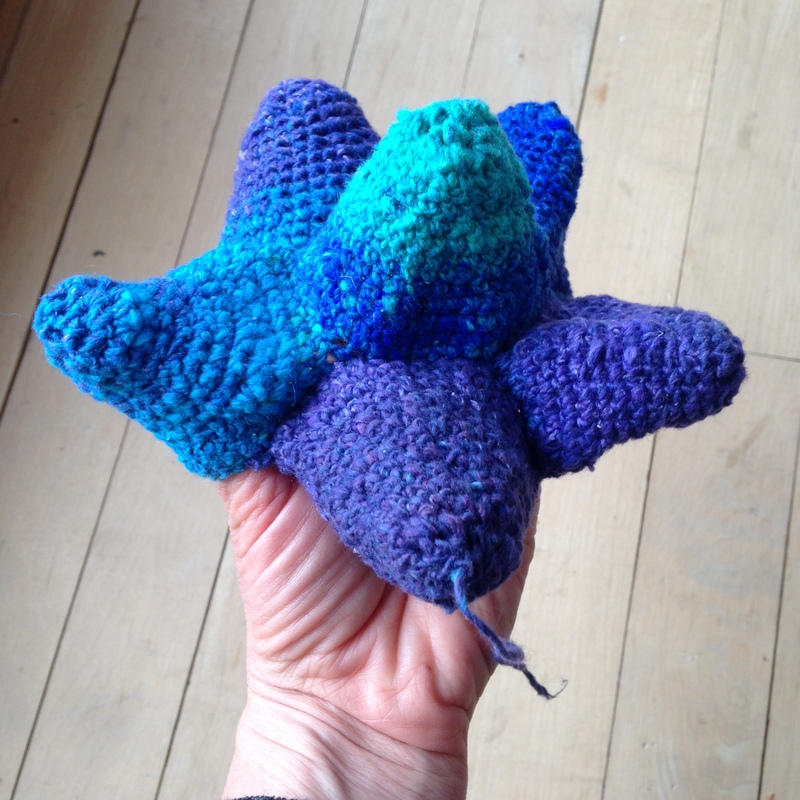 I will probably go back to my trusty merino next time but maybe I have made enough of these stars now. As I was rushing to a meeting in Cirencester last week I passed a really lovely looking wool shop in the aptly named Woolmarket shopping arcade. I managed to resist the temptation until after the meeting but I was just forced into a quick visit. 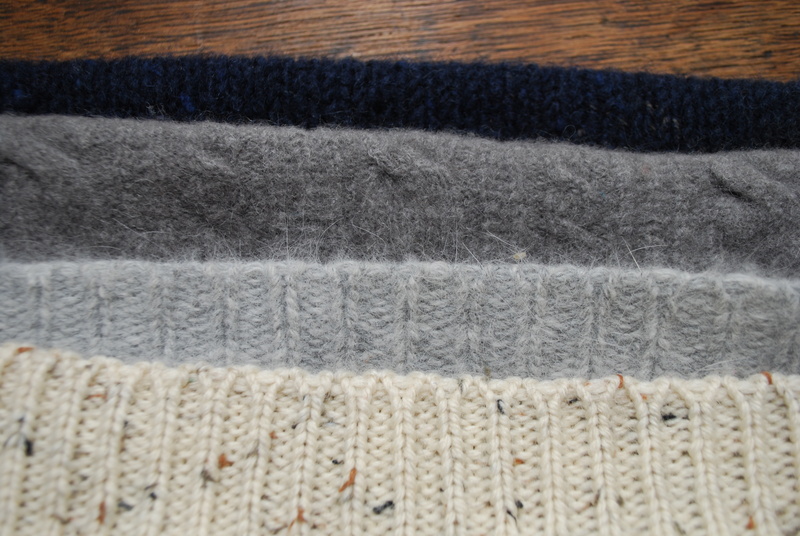 It was Three Sheep Wools and if you happen to be passing it is well worth a look. 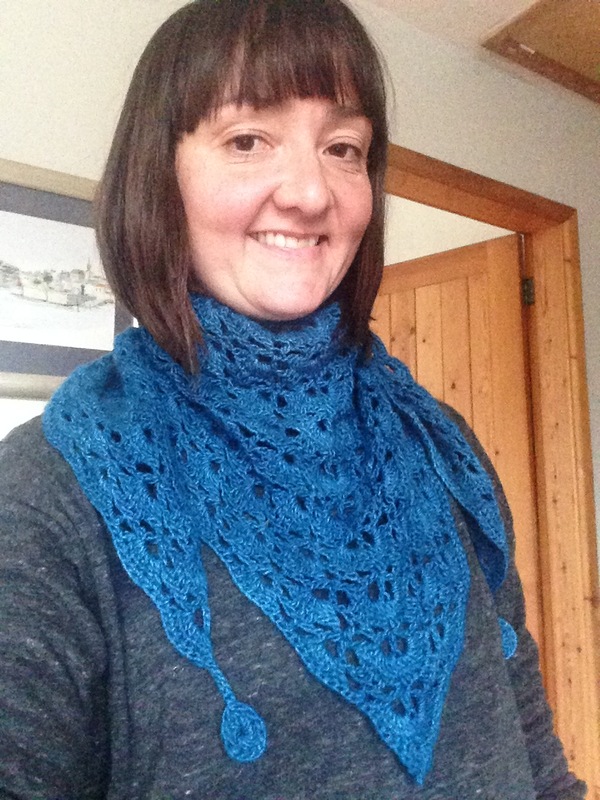 The woman in the shop was so helpful and excited about what I was planning to make that I was even more compelled to buy something and as a chilly wind was blowing a spring shawl/scarf was on my mind. 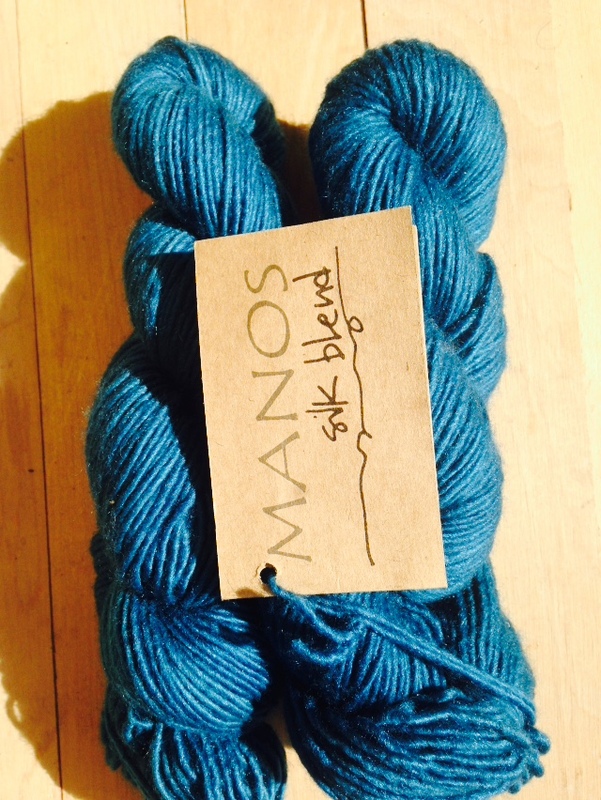 I bought this stunning peacock blue silk merino blend produced by a women’s cooperative in Uruguay. The label even has the name of the woman that made it and where she lives but unfortunately I can’t read the handwriting. I am very committed to ethical sourcing, fair-trade and initiatives that promote and support women in enterprise, so this ticks a lot of boxes for me. It is also gorgeous and absolutely my colour. 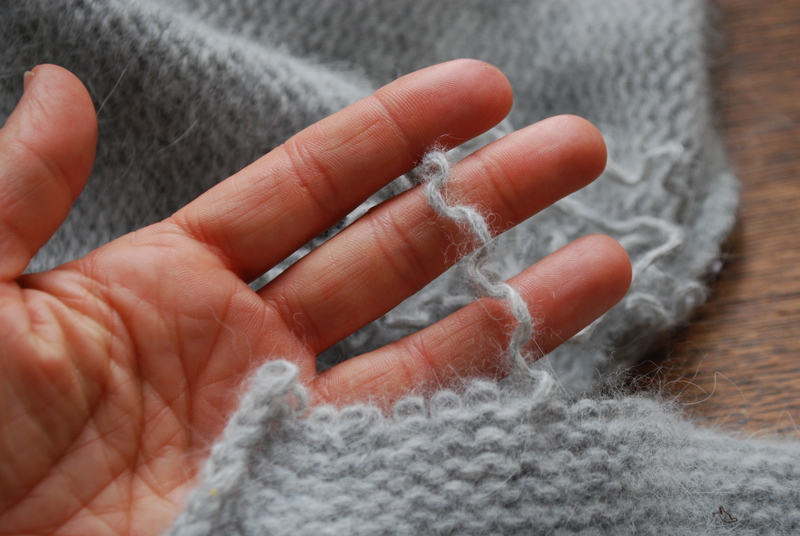 Have a look at the Manos Del Uruguay website to see how the yarns are produced, I think it is really interesting to know where my yarn is from. 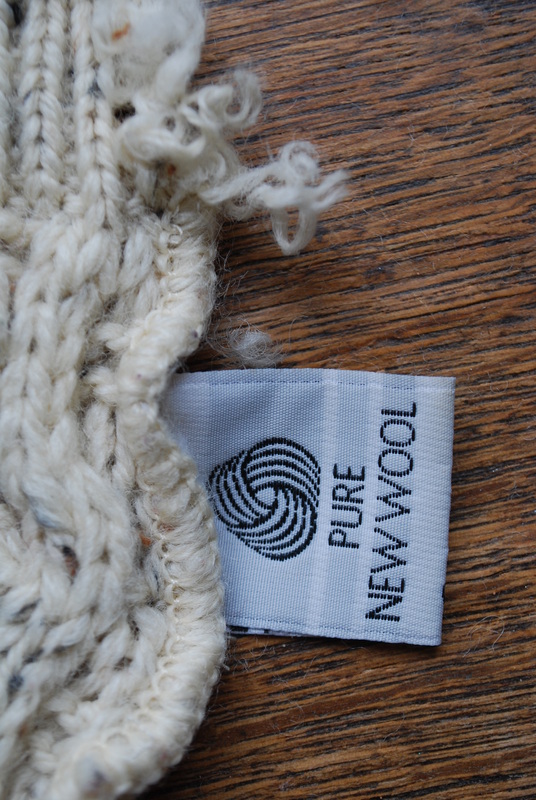 Merino Silk blend from a women’s cooperative in Uruguay which aims to bring economic and social opportunities to rural women. 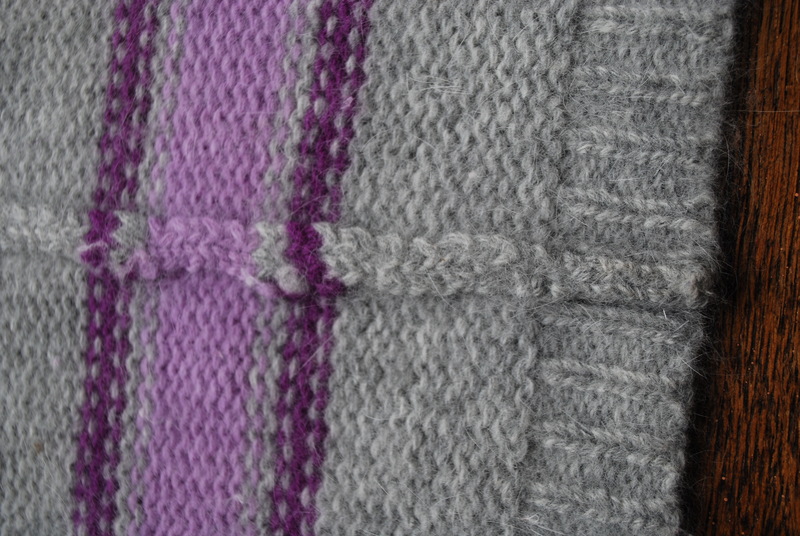 It is the South Bay Shawlette which is a free pattern on Ravelry. 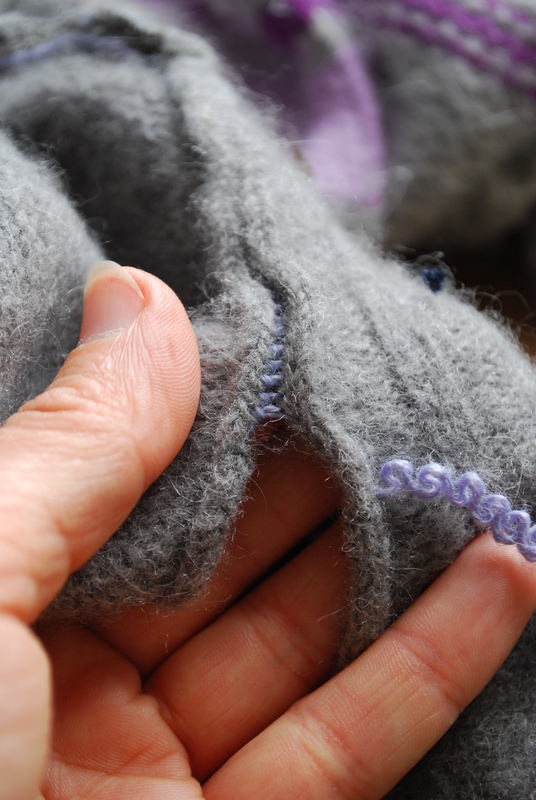 I have made these before and I like the pattern which looks quite intricate but is actually very easy. I did a simple border because I am a simple girl and I added a small bit of embellishment in the form of two circles on each corner. Hope you like it. I do. It’s a story for another day but we are currently building an extension to my parents house for our little family to live in. In the process we had to move the Welsh linen press which is one of the only antiques that we inherited from my grandmother (Mamgu to me) and which came originally from the family farm in the stunning Preseli Hills. 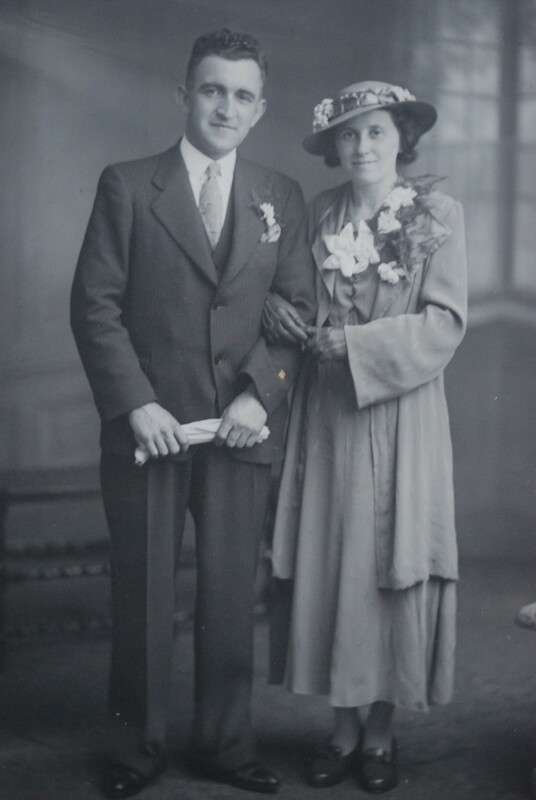 Carefully stashed inside and rarely disturbed are boxes of wonderful photos of severe, black-clad welsh baptists in their sunday best and other precious things from a forgotten time including a hand-stitched baptismal gown, fine lawn handkerchiefs and…her box of unfinished crochet. Mamgu was a fine knitter and crocheter and made classic crochet lace table cloths, doilies and edged her best cotton pillow cases. 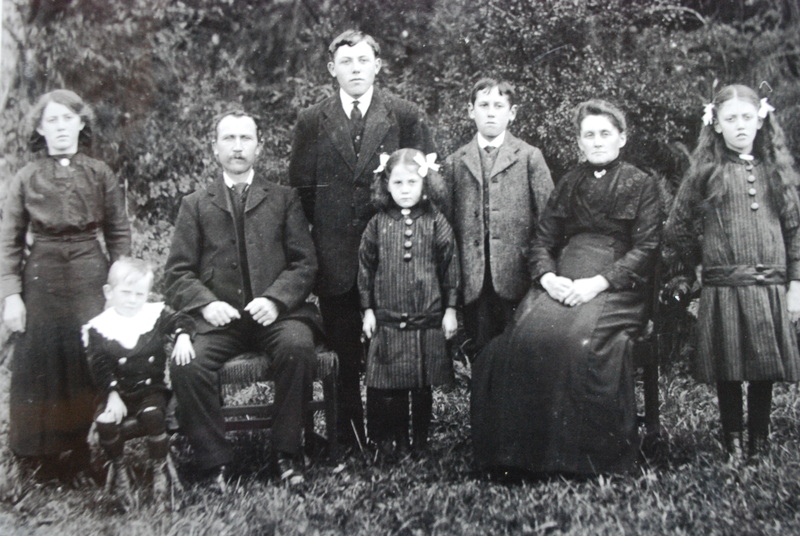 I remember the table cloth vividly, it was always placed over the polished oak dining table and removed at meal times. 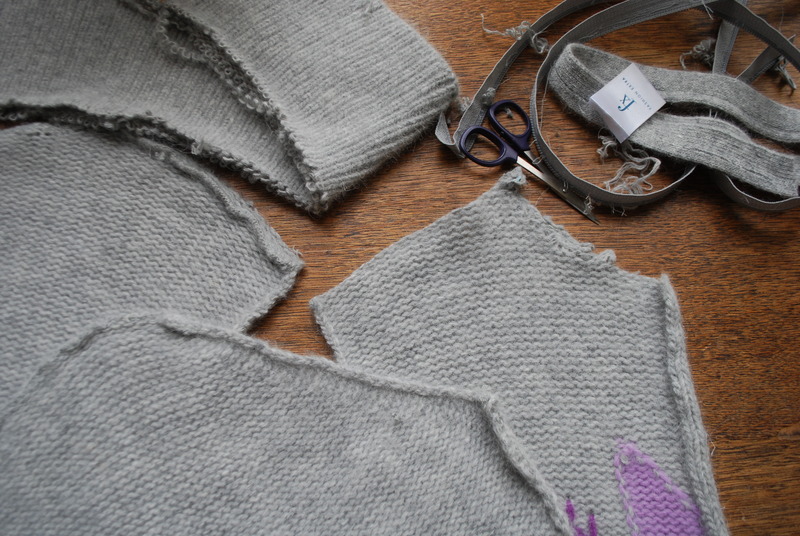 There is something very poignant about a craft item left unfinished. 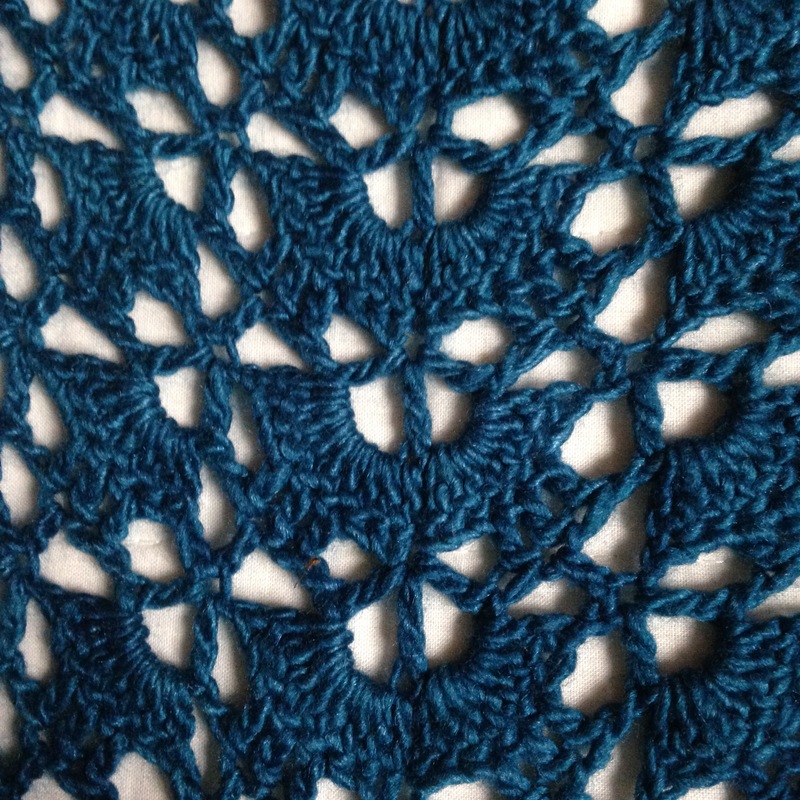 I don’t know what she was making but it looks like the centre of a doily or motif for a table runner or table cloth. It is also incredibly fine work in very fine mercerised cotton thread. I can’t imagine having the patience for anything so delicate. 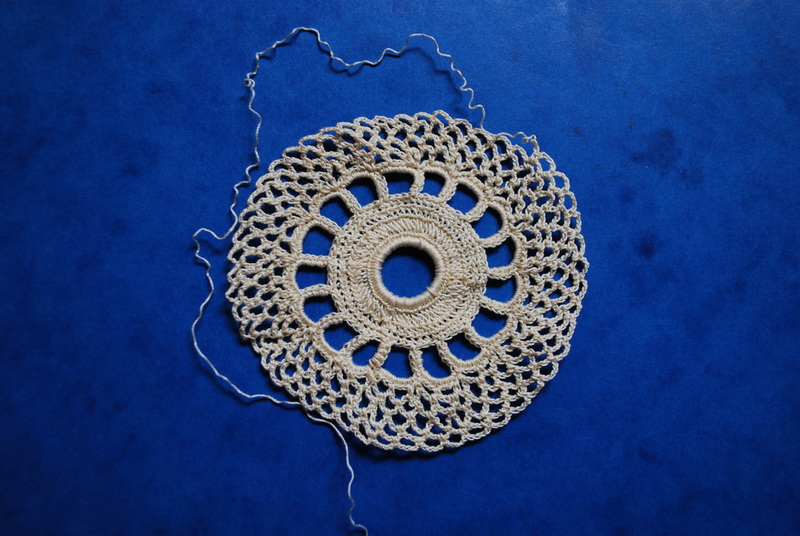 I often find similar doilies and antimacassars in charity shops in unloved fusty piles; the amount of skill and love that went into them long forgotten. 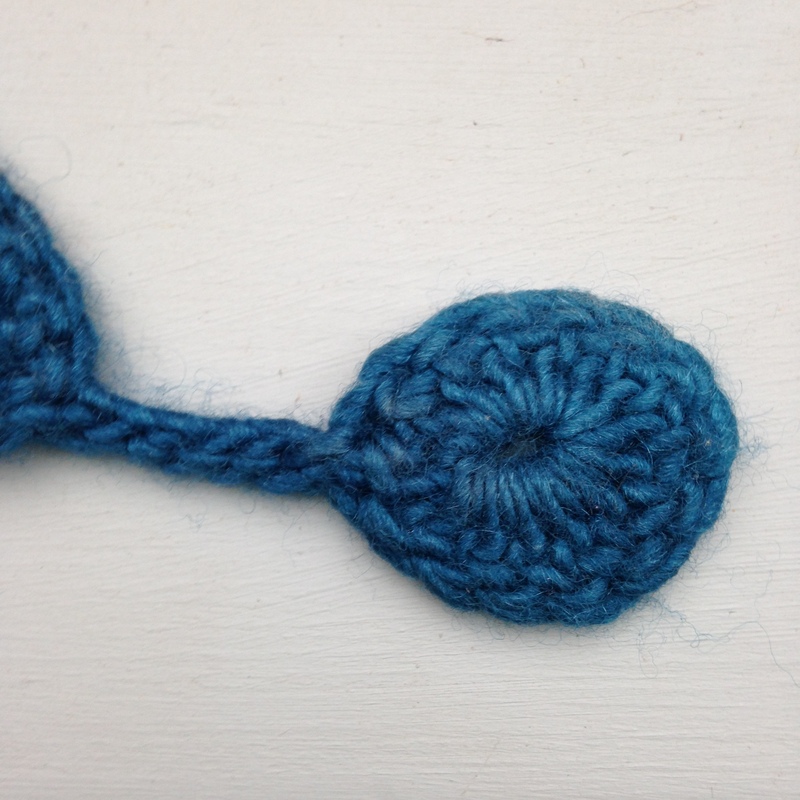 She did try to teach me crochet once, I was probably about nine and I got as far as making a chain. I think that, although I was a keen sewer and cross-stitcher at that age, I didn’t really understand the point of crochet. 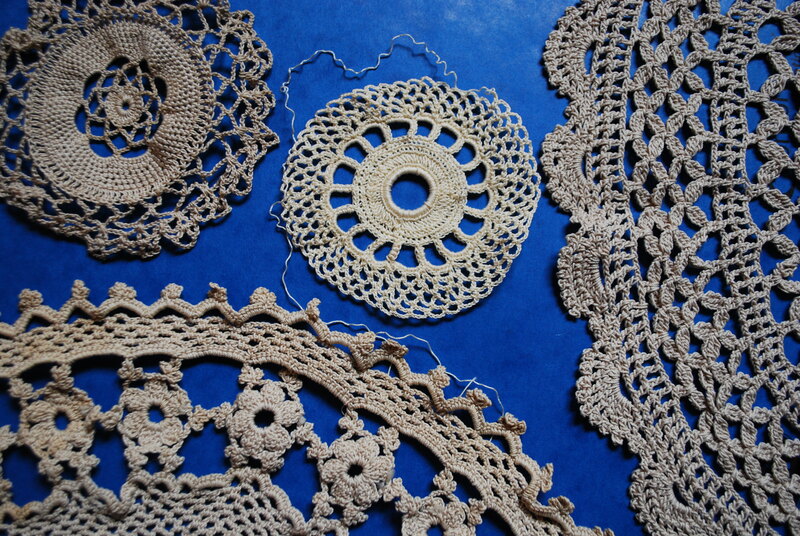 After all, who wants to make old ladies doilies, and what is a doily for anyway? It took me more than 20 years to pick up a hook again and I like to think that she would have been proud of me. 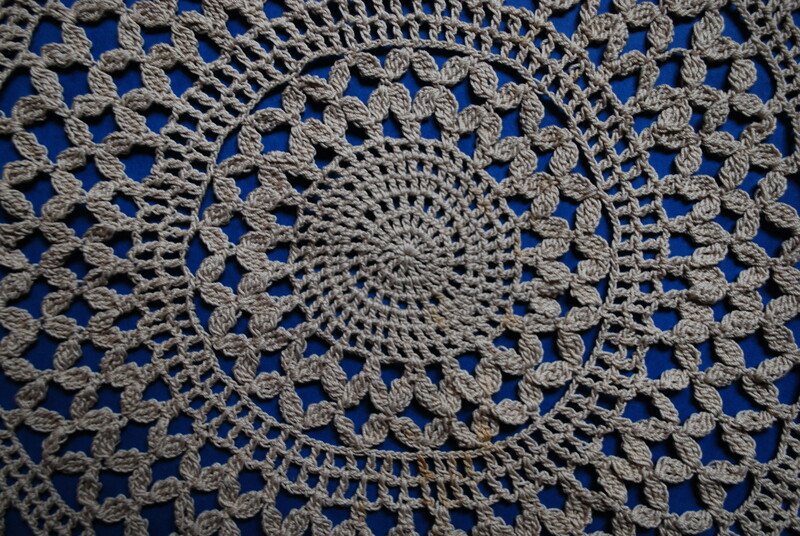 I don’t think I will ever make a doily though, I still don’t really know what they are for. Perhaps they have been reincarnated in the recent fashion for crochet mandalas, surely these are colourful, decorative doilies for our post-colonial times.